A stunning revelation by an online investigative journalism site put the spot on racism in the Finnish police force. Finland's Minister of Interior, the National Police Commissioner and the National Police Board released purportedly strong statements in the aftermath of the scandal -- professing "zero tolerance" for racism and pledging a thorough investigation into the matter. But talk is cheap. It is easier said than done. On 3 June 2017 Long Play published a report about widespread racist commentary in closed Facebook group made up of about 2,800 Finnish police officers. The report included screenshots of some of the comments. One member of the group for instance claimed that people of African descent do not succeed anywhere in the world for reasons including culture and genetics. Another member of the group claimed that Islam is an expansionist religion and that Europe is a victim. According to Long Play, immigrants and Muslims were smeared in many discussions and immigration-related articles and video from known anti-immigration propaganda groups were shared in the group. Police officers in the group mocked an asylum seeker who attempted suicide and a rapper who accused the police of racial profiling. The report also revealed that the head of a national anti-hate speech online task force was once a moderator of the group and moderators didn't intervene to stop racist comments. Long Play also published an in-depth article on racial profiling. 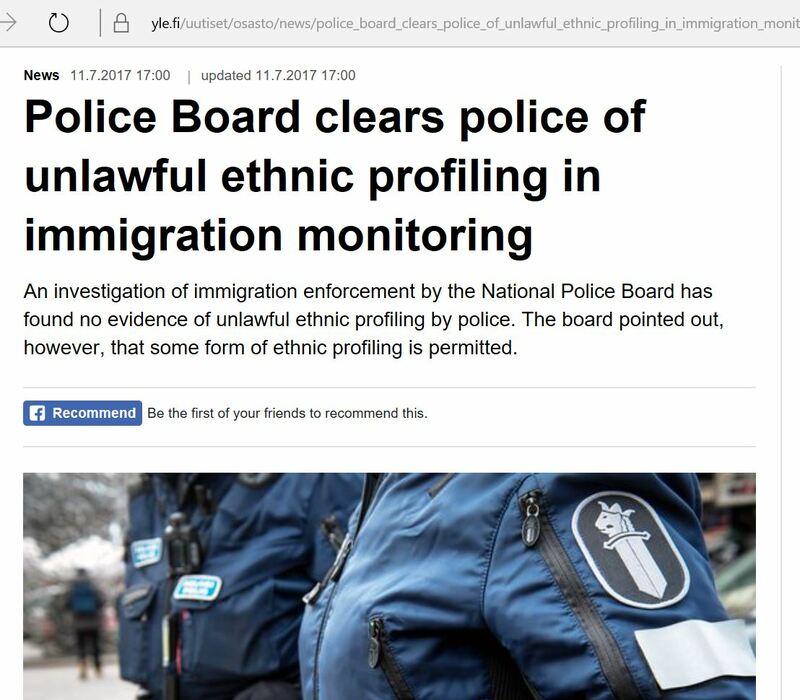 According to the article ethnic profiling is illegal but it happens in Finland continuously - according to Finns belonging to minority groups and police officers who interact with minorities as part of their job. One police officer interviewed for the article acknowledges that he has "certainly" carried out ethnic profiling. "Olen tehnyt etnistä profilointia itsekin, tietysti", he said. He acknowledged profiling the Roma and dark-skinned people. Following publication of the report the Minister of Interior Paula Rusikko and the National Police Commissioner Seppo Kolehmainen sprang into action proclaimed "zero tolerance" for racism. They pledged a full investigation. The National Police Board also announced that the material published by Long Play had been handed to the Office of the prosecutor general to determine whether a preliminary investigation should be launched. The board also proclaimed "zero tolerance" for racism and hate speech in the police force, and stated that it had launched an investigation into ethnic profiling in immigration monitoring. On 11.7.2017 the National Police Board cleared police ethnic profiling in immigration monitoring. And according to Yle a District Prosecutor, Laura Sairanen, decided the previous week not to launch a preliminary investigation into openly racist postings in the police Facebook group. District prosecutor Sairanen and the National Police Board had an opportunity to partially restore confidence in the Finnish police force among people of African descent and other minority groups like Muslims and the Roma but they blew it. In my earlier blog post related to the marvelous piece of investigative journalism by Long Play I gave the Finnish police force the benefit of the doubt in my assessment of whether or not racism is a structural problem in the force. I argued that one ingredient was lacking for the matter to rise to the level of a structural problem: legitimization and normalization of racism. 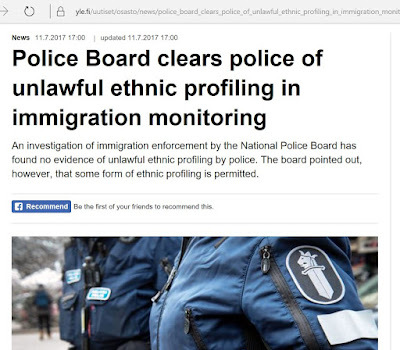 The district prosecutor and the National Police Board just normalized and legitimized openly racist actions by Finnish police officers online and offline by basically rubbishing serious allegations of racism and ethnic profiling. According to Long Play, there's erroneous information in the decision of the prosecutor. One of the grounds for not pursuing the matter reportedly put forward by the District Prosecutor assigned to the case is that the identities of those who posted comments in the Facebook group are not known. The claim doesn't hold water, according to Long Play, because names were visible in over 50 screenshots handed over to the office of the prosecutor general. Another reason for turning a blind eye to the openly racist comments is that the plaintiffs or injured parties have not made a police report of an offence. How convenient! The prosecutor reportedly wrote in her decision that the Facebook comments seem to have been written during the police officers' free time although according to Long Play posting were made in the Facebook police group at all times of the day, and the prosecutor didn't bother to ask the police board or police departments for clarification about working hours. Again -- how convenient! The National Police Board on its part also dropped the ball on the investigation into ethnic profiling. According to a statement by the board the investigation focused on immigration monitoring, and police departments' immigration monitoring guidelines and practices were examined. The board also examined whether police departments have had to intervene in illegal ethnic profiling cases. The investigation found four cases in which officials' actions had been looked into for possible ethnic profiling but no wrongdoing was found. On these basis the board cleared police of ethnic profiling in immigration monitoring. Mindful of the fact that the probe was sparked by a report by Long Play that alleged routine ethnic profiling it is unclear if the National Police Board actually read the detailed report and made an effort to contact at least some - if not all - of the victims of alleged ethnic profiling who were interviewed for the report. A total of 94 people belonging to minority groups, 12 police officers and 6 people who know about the subject through their work were reportedly interviewed by Long Play but the National Police Board's investigation seems to have been limited itself to looking at paperwork provided by various police departments and then concluding that there is no illegal ethnic profiling. Poliisihallituksen selvitys: Poliisilaitoksilta kysyttiin teettekö laitonta etnistä profilointia. Yksikään ei myöntänyt, joten sitä ei ole. The board basically asked police departments if they practice ethnic profiling. None of the departments said they do hence the board cleared police of wrongdoing. Besides the superficial nature of the investigation it is also problematic that it focused on immigration monitoring although the report that triggered the investigation raised ethnic profiling of Finnish Roma individuals who are not subject to the Aliens Act but are reportedly eagerly stopped by traffic police. The way I see it the District Prosecutor and the National Police Board didn't carry out a "full" investigation as pledged by the Minister and Interior and the National Police Commissioner. They rushed the investigation and bungled it. It's hard to imagine that a comprehensive and impartial investigation into such a serious matter was completed by both the office of the Prosecutor General and the National Police Board in about six weeks. Perhaps an independent commission should be set up to look into the matter.